Everyone needs a “go-to” wine… one that is enjoyable with or without a meal… one that you can bet you’ll find in most stores that sell wine… and one that isn’t going to wreck your budget. This week’s Divine Wine is one that I’ve enjoyed a number of times for the reasons listed above. Most recently, I sipped on it a few days ago to make sure it was fresh in my mind for today’s post. So, for a go-to wine, may I suggest…. Price Range: $8-12 in most stores (in Arizona), $8.47 at Total Wine, available in most grocery stores as well as Costco. I would describe this lovely bottle as a light-bodied red that is a little watery, but I don’t mean that in a bad way… More in a way that just makes it easy to drink. It is fruity – strawberries come to mind. But it isn’t overly sweet. It’s almost like having a cup of juice (the alcohol free kind) and this Wino has to be careful not to take too many sips too quickly. I usually buy this one in multiples because it is nice to enjoy on Saturday afternoon or on Tuesday evening. …Coffee Talk Interlude: Note there is a red wine known in California and referred to as a gamay Beaujolais that is neither made from the gamay grape nor is it related to Beaujolais. It is a pinot noir clone. Discuss amongst yourselves…. The grape description above translates into the flavors one will taste in a Beaujolais wine, which is what makes it so enjoyable and easy to drink. While the flavor of the grape plays a huge role in the outcome of htis wine, it is also obtains some of its character via the “carbonic maceration” process. That means that whole grapes (in clusters) are put into a fermenting tank and the fermentation takes place inside each grape. It then rests in the tanks for 5-9 months and then is bottled and sold. This carbonic maceration process can be used for any grapes, but apparently is best with super fruity grapes, like gamay. What does Maison Louis Jadot (the winemaker) say about this wine? Ok, so I’m a bit thrown off by the “spicy” description (made both by the general description of gamay and Beaujolais from The Wine Bible as well as from the winemaker’s website). I will have to try this wine again with new taste buds to see if I can find the “spiciness”. But I clearly agree with the “sole wine of a meal” comment! …Tidbit extra of Wine Know: Beaujolais Nouveau is different than the Beaujolais wines… (another future blog post)… but don’t get it confused, Winos! So hopefully you Wine Know a little more about Beaujolais in general. 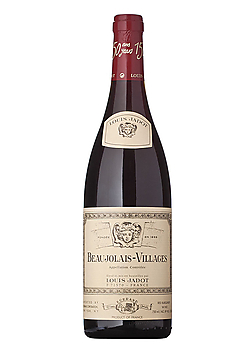 If you run out to buy a bottle of Louis Jadot’s Beaujolais Villages, let me know what you think! I miss my ‘go-to’ wine, as I can’t get it out here, so I am finding new ones…due to the different climate my go-to wine has changed from a good red to a light and refreshing green wine. All that being said, I will add your ‘go-to’ to my list of things to try! Do share, Ms. Bique, what your go-to (both old and new) wine is!! I look forward to hearing what you have to say about it!! This wine is one of my favorites. It’s perfect with heavier roast flavors, garlic and white cheeses. The 2010 Vintage is one of the best I’ve had so far. Lovely! I continue to love this wine as well! !